Stonehenge is a prehistoric monument, located in Wiltshire, an English county. 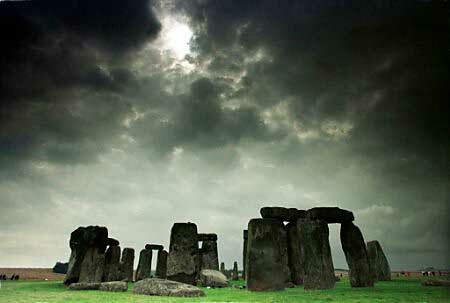 Some archaeologists believe that Stonehenge was built in 2500 BC. However, a recent theory suggests that the monument wasn't built until approximately 2200-2400 BC. There are many theories about Stonehenge. For example, some archaeologists believe that the monument was used for rituals. The prevailing theory regarding the purpose of the structure has been that it is was an observatory, allowing the builders to measure the solstice and equinox dates, or the heliacal rising of certain stars. However, recent evidence suggests that Stonehenge may have been a memorial site (grave site) associated with a large nearby settlement. This claim has been made by other many websites which support the theory. Some proponents link Stonehenge with the so-called Mayan prediction, and the 'creation' of the Sumerian language1. Also frequently referenced with Stonehenge is Nibiru, for reasons that are not readily apparent. According to an article at ufos-aliens.co.uk what we see today is a product of extensive reconstruction efforts carried out between 1901 and 1964. From 1901 to 1964, the majority of the stone circle was restored in a series of makeovers which have left it, in the words of one archaeologist, as 'a product of the 20th century heritage industry'. Evidence clearly shows that Stonehenge is not a doomsday clock, and while its origins are ancient, extensive rebuilding in the early 20th century has destroyed its original position and configuration. 1. Sumerian cuneiform writing dates to about the time of the construction of Stonehenge. However, Sumeria was located in what is now Iraq, about 4,300 kilometers away, and no connection between the two cultures has ever been demonstrated.